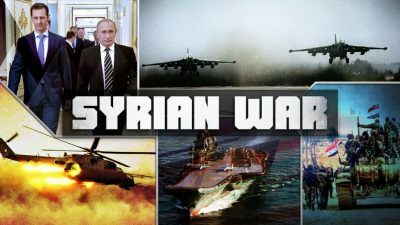 We bring to the attention of our readers South Front’s detailed documentary on Russia’s military campaign in Syria. Russia’s capabilities of providing military supplies to Syrian government forces and humanitarian aid to the local population, have both played an important role in establishing Russian forces as an influential and reputable power within Syria, which can play the role of a mediator among various factions on the ground in the war-torn country. In comparison, all other foreign powers involved in the conflict are forced to rely on a limited number of proxy forces, which have often proven to exhibit a harsh attitude toward, and competition with their counterparts and competitors. On the other hand, this situation puts restrictions on Moscow’s actions in some spheres, because it must balance its public and formal positions to push forward the promoted political settlement while pursuing Russia’s own national security and political goals simultaneously. To put Russian actions in Syria and the Middle East in general in perspective, one should think back to what the situation was like on the eve of the direct Russian intervention in the conflict. At that moment, the Syrian branch of al-Qaeda – Jabhat al-Nusra (now known as Hayat Tahrir al-Sham) – and other radical militant groups, often branded in the mainstream media as the moderate opposition, as well as ISIS, were engaged in an increasingly successful offensive against the Syrian government on multiple frontlines. Jabhat al-Nusra and its allies were at the gates of Damascus, in control of large parts of northern, western and southern Syria, as well as multiple areas within the government-held areas, including about a half of the city of Aleppo, often described as the second Syrian capital. At the same time, ISIS’ self-proclaimed Caliphate was rapidly spreading throughout the eastern and northern parts of the country. The terrorist group was in control of a major part of the Syrian oil resources, the strategically important cities of Deir Ezzor and Raqqah, and controlled a sizeable border with Turkey. The US, Israel, Turkey, Saudi Arabia, Qatar and other countries of the so-called civilized world were either providing direct and indirect supplies or assistance to Jabhat al-Nusra and its allies in an effort to overthrow the Assad government. The US-led coalition against ISIS achieved little success in combating the terrorist group and destroying its infrastructure. The so-called Caliphate had clearly expanded its territory and power since the coalition’s formal establishment on June 13, 2014. ISIS’ oil business was on the rise with illegal oil flows streaming throughout the region and even reaching the broader international market. All of these forecasts appeared to be doomed to failure on September 30, 2015 when warplanes and attack helicopters of the Russian Aerospace Forces started pounding militants across the country, irrevocably shaping the course of the conflict. Units of the Russian Special Operations Forces arrived to direct airstrikes, to conduct reconnaissance missions, and a host of other classified missions deep behind the enemy’s lines. Behind the scenes, Russian military advisers started planning and directing offensive operations and kicked off a long and complicated process of transforming the Syrian Army and pro-government militias into a force capable of defeating the terrorists and to liberate the country. The regional power with its economy “in tatters” [Obama sic] appeared to be capable of projecting power, providing assistance and highly professional military advising, and large-scale counter-terrorism missions in a key global region approximately 1,482 nautical miles from the Black Sea Fleet based at Sevastopol, Crimea to the Tartus naval facility in Latakia, Syria. One of the key reasons behind the Russian decision to launch its operation in Syria was the very logical concern over growing security threats from terrorist groups near Russia’s southern borders and the possibility that some powers could use terrorist groups in the larger, ongoing geopolitical standoff. Russia has already had to struggle with this reality in the Caucasus regions of Chechnya, Dagestan and Ingushetia starting in 1994. Brought largely under control in 2009, Russian security forces continue to battle Islamic insurgents in these regions. The Syrian-Iraqi battleground is located approximately 450 km from the border of the former USSR. Russian has been a target of terrorism perpetrated by radical Islamist groups for decades. Considering the rapid growth of ISIS in 2014, some Western actors would like to see the expansion of this entity or other quasi-state terrorist structures into Russia’s South Caucasus or the border area with the Central Asia. Thus, Moscow found common ground with the governments of Iran, Syria and Iraq and even the leaders of Hezbollah, all of whom were also concerned with the growth of highly organized and ideologically motivated Sunni terrorism in the region. These factors led to the creation of the Russian-Syrian-Iranian-Hezbollah alliance and the establishment of a HQ in Baghdad for joint intelligence-sharing cooperation and anti-terrorism coordination between these nations. The alliance was de-facto formed and the Baghdad HQ was established immediately after the start of the Russian military operation in Syria in late September. The A-50 airborne early warning and control aircraft, Il-20M1 electronic, radar reconnaissance aircraft and Tu-214R electronic surveillance aircraft were another component of the Russian “reconnaissance-strike complex” keeping control of Syrian airspace and detecting troop and supply movements on the ground as well as locating militant commanders, headquarters, weapon depots and other key infrastructure by detecting their electronic communications’ signature an locating its source. Russia has been developing a number of advanced electronic warfare, surveillance and command and control aircraft over the past two decades. Krasukha-4 and other electronic warfare systems are also an important component of the Russian forces’ air defense capabilities. According to some experts, these systems were employed during two US-led missile strikes on Syrian government forces in 2017 and 2018, and were likely an important factor behind the questionable success of these US attacks. The Russian naval force involved in the conflict was in its strongest shape in the period of November 2016 to January 2017 when the Kirov class nuclear-powered battlecruiser Pyotr Velikiy, heavy aircraft-carrying missile cruiser Admiral Kuznetsov and two Udaloy class anti-submarine destroyers were deployed along with a number of smaller support vessels. This group significantly expanded air-defense, anti-ship and anti-submarine capabilities of the Russian forces. Mig-29KR/KUBR and Su-33 jets attached to the Admiral Kuznetsov also took part in the aerial operation against militants in the country, carrying out 420 combat missions and hitting 1,252 targets, according to the Russian Defense Ministry. On the other hand, Admiral Kuznetsov’s air wing lost a MiG-29K jet and a Su-33 jet during the Syria deployment, because of technical faults during the aircraft arrested-recovery process. This highlighted problems and limitations of the Russian naval aviation at its current stage of development and maturity. Importantly, the most valuable asset involved in both of these accidents, the pilots, were rescued by the vigilant recovery teams of the naval task force. Warships of the Black Sea Fleet and the Caspian Sea Fleet also participated in the campaign carrying out Kalibr cruise missile strikes on ISIS and Jabhat al-Nusra targets, mainly weapon depots, headquarters, and other high value, hardened targets. Although western mainstream media tried to downplay the significance of Kalibr cruise missile strikes from both surface warfare vessels and submerged submarines, these attacks very clearly illustrated the success of the Russian defense industry in producing high tech cruise missiles, as well as the Russian military’s proficiency at utilizing them. In conjunction with direct military intervention, Russia boosted military aid to the Damascus government and its allied forces. To accomplish this, Russia established an aerial and naval logistics supply network that came to be known as the “Syria Express”. The Syrian Arab Army (SAA) and sanctioned pro-government factions have been supplied with military equipment, including armored vehicles and battle tanks, artillery guns, multiple rocket launchers, anti-tank guided missiles and other needed arms and munitions. It’s widely known that Moscow even provided a limited number of T-90 main battle tanks, TOS-1A Solntsepyok heavy flamethrower systems and Uragan multiple rocket launcher systems. The Syrian military has also received Pantsir-S1 air defense systems and materiel support needed for the maintenance of its aircraft and air defense systems. In the province of Latakia, Russian forces propelled an advance of the SAA along the M4 highway, allowing government forces in the period from October 2015 to August 2016 to reassert control over the province. The SAA, the NDF and other pro-government factions significantly shortened the militant-held part of the Syrian-Turkish border, culminating in the capture of the strategically important town of Kinsabba. The front in northern Latakia was stabilized and the threat of a Jabhat al-Nusra-led offensive on the Syrian coast was neutralized. The Russian Su-24 warplane was shot down by the Turkish Air Force during this very advance. Ankara did not desire a Syrian government restoration of control over the country’s border, as Turkey’s political elite were benefiting greatly from illicit trade across the border, as well as providing the free flow of reinforcements and resupply of militants operating in Syria. One of the key factors behind the success of the SAA and its allies was a massive air campaign carried out by the Russian Aerospace Forces. Russian aircraft not only provided close air support to government troops, but also contributed significant efforts to destroying infrastructure of Jabhat al-Nusra and ISIS striking their convoys, gatherings, weapons depots, HQs and other facilities deep behind the actual frontlines, attacking targets in the provinces of Idlib, Aleppo, Deir Ezzor and Raqqah. ISIS’ oil infrastructure and oil convoys were among the most important targets of the air campaign. Thus, the Russian military undermined one of the terrorist group’s key financial resources. With the collapse of the attempted ceasefire, the SAA’s campaign to retake Aleppo took place from June 25, 2016 to December 22, 2016, ending with the government’s liberation of the entire city. During the summer phase of the campaign, the SAA and its allies advanced in the Mallah Farms area and cut off the Castello Road, the only supply line to the militant-held, eastern part of Aleppo. Then, government troops repelled all militant attempts to break the siege. Especially fierce clashes took place in the area of al-Rashidin in October and November. A battle of attrition was waged on the encircled militants and during the final phase of the advance, militants lacked weapons and supplies to counter government advances, while the SAA effectively used its advantage in military equipment, manpower and firepower. Humanitarian corridors were also opened to allow civilians to withdraw from the combat area. Both of these attacks took place during the key stages of the battle for Aleppo. Thus, ISIS and Jabhat al-Nusra de-facto united their efforts in attacking the SAA and its allies along different fronts, in an attempt to draw crucial Syrian military manpower and effort away from its operation to liberate the strategic city. The Jabhat al-Nusra-led advance in northern Hama started on August 29 and lasted until November 6. This attack was actively supported by Jund al-Aqsa, which in 2017 merged with ISIS, as well as other so-called moderate opposition groups. Using surprise effect and suicide bombers, militants broke the NDF’s defense and captured a number of villages. In September, October and early November, fierce clashes continued. By November 6, the SAA, the NDF and their allies had been able to reverse the militants’ gains and to stabilize the front. According to available data, ISIS concentrated up to 5,000 militants for the December advance. The government’s positions were defended by about 3,000 fighters, including units of the SAA, Hezbollah, Liwa Fatemiyoun and later the Tiger Forces. They were backed up by Syrian and Russian air support. According to pro-government sources, over 600 ISIS members were killed in the clashes. Pro-ISIS sources claim that over 300 pro-government fighters were killed. During the months of October and November, prior to the pivotal victory in Aleppo, the SAA also carried out a successful operation in the Damascus countryside, liberating the militant-held sector of Western Ghouta. Government forces broke the militants’ defense and in late November forced them to accept a reconciliation agreement. A significant number of militants and their families departed to the militant-held territory of Idlib. Many combatants and their families chose to remain in the area and settled their legal status with the Syrian government, under the supervision of security forces. From January through June, government forces forced ISIS terrorists to retreat along a wide front in eastern Aleppo, leading to the liberating of the Jirah Airbase, Deir Haffer, Maskanah and a number of other points. By the middle of June, the SAA advanced into the southern periphery of the province of Raqqah. This caused great consternation in the mainstream media and led to a growth of tensions with the US-led coalition and its proxies. On June 18, an F/A-18 Super Hornet from the USS George H.W. Bush aircraft carrier shot down a Syrian Air Force Su-22M4 south of the town of Tabqah, which was then occupied by the Syrian Democratic Forces (SDF) – a Kurdish dominated coalition of armed groups backed by Washington. The Su-22M4 was supporting the SAA’s anti-ISIS operation in the area. The US claimed that the warplane was posing an imminent threat to the SDF, and was shot down in an act of self-defense. Regardless of efforts of both ISIS and the U.S. led coalition and its proxies on the ground, the SAA established control over the key junction of Resafa, thus securing the Ithriyah-Resafa road and cutting the SDF off from any advance into central Syria. During the clashes, about 550 militants were killed and about 1,200 members of militant groups surrendered to the SAA. According to pro-militant sources, government forces lost up to 600 fighters. The mainstream media and pro-militant outlets also claimed that “thousands” of civilians died during the operation, but this number has never been verified. By June 2018, the SAA and its allies had liberated a large part of the country, including the cities of Aleppo and Deir Ezzor, the entire countryside of Damascus, and had liquidated the many pockets of opposition that had existed in the government-held portion of the country. ISIS’ self-proclaimed Caliphate in Syria had been taken apart in a series well planned and decisively executed military campaigns. Russia has played an important role in the logistics and maintenance support of the SAA, both in general and on an operational level. According to the Defense Ministry, Russian specialists are actively involved in assisting the Syrian military in maintaining and recovering military equipment. While most of this activity remains unpublicized, it’s known that in 2015 the Russians restored a tank-repairing plant in the city of Homs. The plant is currently operated by the Syrian government. Additionally, Russian specialists and officers contributed to the improvement of Syria’s air defense capabilities, while providing both maintenance support to air defense systems and radars and training to Syrian officers. In April 2018, the Russian state-run news agency RIA Novosti reported, citing a source in the Russia Defense Ministry, that Russia had delivered at least 40 Pantsir-S1 short to medium range defense systems to Syria over the past few years. Syrian warplanes resumed their operations from the airbase a few hours after the US strike. The Russian Defense Ministry described the “combat effectiveness” of the attack as “extremely low” adding that only 23 missiles hit their intended targets. According to existing visual evidence, 10 Syrian aircraft were destroyed: three Su-22, four Su-22M3, and three MiG-23ML. According to some sources, the number of targeted aircraft could be up to 15; however, sources at the airbase have said that most of the destroyed aircraft had been already damaged or out of service. According to Pentagon spokesman Captain Jeff Davis, “Russian forces were notified in advance of the strike using the established deconfliction line”. There is no doubt that Moscow informed the Syrians who had withdrawn most of their assets from Shayrat Air Base prior to the strike. This could explain why no real damage was incurred from the strike. International investigators have never visited Khan Shaykhun nor Shayrat Air Base. 7 missiles hit “Him Shinshar CW Bunker”. On April 27, Russian and Syrian officials as well as witnesses of the alleged chemical attack participated in a press conference in The Hague. The event was entitled “Presentation by the representative of the Ministry of Defense of the Russian Federation with direct participants of the fake video produced by ‘White Helmets’ on 7th April 2018, in the Hospital of Douma”. The data provided during the press conference debunked the Western-backed version of the events. Russia brought 17 witnesses of the incident, as well as Douma hospital staff members to The Hague. OPCW technical experts interviewed only 6 of 17 witnesses. The cases of Aleppo, Eastern Ghouta, the Rastan pocket and other regions demonstrated that Russia’s leadership appeared to be aware of both the limits of the country’s power and of what can be accomplished using solely military means. Almost immediately after the start of the anti-terrorist campaign in Syria, Russian forces started participating in humanitarian operations across the country. The Centre for the Reconciliation of Opposing Sides, headquartered at the Khmeimim Air Base in the Syrian Arab Republic, is the main force carrying out humanitarian operations and promoting reconciliation efforts. The Russian Defense Ministry is an unreliable source of information in comparison to the Pentagon or the US Department of State or even to such “independent” organizations as the Syrian Observatory of Human Rights, the White Helmets and Bellingcat. These claims are especially interesting, because they exploit the audience’s lack of information about the conflict and mix facts with exaggerations or even outright lies. While the Russian side is also far from being innocent in promoting a one-sided version of the story, the US and its allies have a much larger and better funded media conglomerate by which to spread their propaganda. Mistakes of the Russian Defense Ministry in the coverage of its military operation in the country also played their own role. In the third part of Oliver Stone’s Showtime special “The Putin Interviews” broadcasted from June 12 to June 15, 2017 Putin took out a cellphone to show Stone a clip of how Russian aircraft were striking militants in Syria. The video that appeared was US gun camera footage originally filmed in Afghanistan in 2013. On October 24, 2017, Defense Minister Sergei Shoigu stated that since the start of the operation in Syria, 503,223 km2 were liberated from terrorists. The problem here is that Syria’s total area is about 185,180 km2. Shoigu’s figure is 2.71 times larger than the entire country as it existed before the conflict. One could describe these incidents as probable acts of informational sabotage. Putin does not use a personal cellphone, so some person had to have prepared the video beforehand. A Defense Ministry staffer provided Shoigu with the grossly incorrect figure, and someone released obviously fake photos via the defense ministry’s social media page. Were these very amateurish mistakes, or calculated sabotage? It is most probable that all of these cases are the result of the gross negligence or low quality of work of some middle to low level staffers involved in providing informational support concerning Russia’s military actions in Syria. Only a small portion of the Russian Defense Ministry’s statements can be found on its website. Content demonstrated during press conferences – maps, photos and detailed information – is not translated into English and is not uploaded to the official ministry website after press conferences. The Russian mainstream media, such as Sputniknews and RT, do not attempt to cover all of the facts and details revealed during the press briefings. Thus, a major part of the audience, especially an English-speaking audience, remain uninformed about key facts and evidence provided. This situation is another factor allowing the Western mainstream media, pundits and experts to ignore the key arguments of the Syrian-Iranian-Russian alliance and to push their own narrative. On April 26, 2018 Syrian and Russian officials held a press conference in The Hague. As previously stated, it was entitled “Presentation by the representative of the Ministry of Defense of the Russian Federation with direct participants of the fake video produced by ‘White Helmets’ on 7th April 2018, in the Hospital of Douma”. The press conference included a detailed overview of the results of the Russian-Syrian investigation of the April 7 incident in Douma with photos, videos, and statements from experts and eyewitnesses. None of the content demonstrated during the 2 hour press conference was uploaded online. No comprehensive coverage of the entire story, including facts and details, provided during the event appeared in the Russian mainstream media’s English language reporting. On February 8, 2018 the US-led coalition released a statement saying that on February 7th it had struck “pro-regime forces” attacking “Syrian Democratic Forces headquarters” in the Euphrates Valley. According to local sources, the US strikes hit pro-government forces in the area between the village of Khasham (controlled by the government) and the CONICO gas facility (controlled by the SDF). Pro-government forces, supported by some PMCs, were allegedly trying to recapture the gas facility from the SDF. Almost immediately after the first reports of the US strikes, western MSM outlets started releasing reports based on anonymous sources that stated that between 100 and 300 “pro-Assad fighters” were killed by the strikes. A few days later, once again relying on anonymous sources, 100 to 300 allegedly killed “pro-Assad fighters” morphed into 100 to 300 killed “Russian fighters” – i.e. PMCs. Some “experts” and outlets even claimed that this number was much higher, in the realm of 600 killed. The story developed further on April 12, when Michael Pompeo, then the CIA director recently nominated to be US State Secretary, claimed that the US had killed “a couple hundred Russians”. On April 20, US President Donald Trump provided his own statement based on the same story, claiming that there was a direct engagement between US and Russian troops in Syria and “many people died in that fight”. On February 14, the Russian Foreign Ministry confirmed that five “presumably Russian citizens” could have been killed in Syria and described reports about “mass” casualties among the Russians as fake news. The MSM has continued repeating the “300-600 killed Russians” story for almost half a year now. The narrative works because there is no official data on Russian PMCs in Syria. The MSM can effectively repeat a story which has no factual basis, while claiming that the Kremlin is hiding hundreds of casualties, because the Russian government continues to maintain a position of strategic ambiguity regarding the issue of Russian PMCs’ activities in Syria. Meanwhile, Turkey made attempts to normalize relations with Russia. After the Turkish Air Force shot down a Russian Su-24 jet in Syria on November 24, 2015, Moscow deployed additional forces to Syria, broke contact with the Turkish military and imposed painful economic sanctions on Ankara. By June 2016, President Recep Tayyip Erdogan and the rest of Turkish leadership had come to the conclusion that they had to restore economic and military cooperation with Russia. Ankara appeared to be drawing into Russia’s sphere of influence, at least as far as working on mutually beneficial end to the conflict. Through its campaign in Syria, Moscow promoted its economic interests. President Bashar al-Assad and other officials have repeatedly stated that Syria is going to grant all the contracts on restoration of the country’s infrastructure to its allies – i.e. Iran and Russia. Russian companies are already participating in the energy projects, both oil and natural gas, in the country and are preparing to expand their presence in the country. Syria will be able to rebuild after a devastating war and Russia will increase its economic and political power in the region, while further securing economic benefits for its citizens at home. The operation also contributed to Russia’s national security. As it was noted in the start of this video, Russia has always been a target of terrorist activity of various radical groups, including ISIS and al-Qaeda. Some Western state actors have endorsed at least a part of this activity. It is notable that no major terrorist attacks have been carried out inside Russia since 2015. Russian forces eliminated a large number of militants in Syria who were members of terrorist groups originating in its Southern Caucasus regions created in the post-USSR era. This is already proving to be a major blow to the remaining cells of these groups hiding in Russia, because they have lost their most experienced and ideologically motivated members in Syria. The expansion of Russian military infrastructure, including naval and air bases in Syria, shows that Moscow is not going to withdraw from the country in the near future. Russia will continue its efforts to defeat terrorism and to settle the conflict using a variety of military and diplomatic measures.